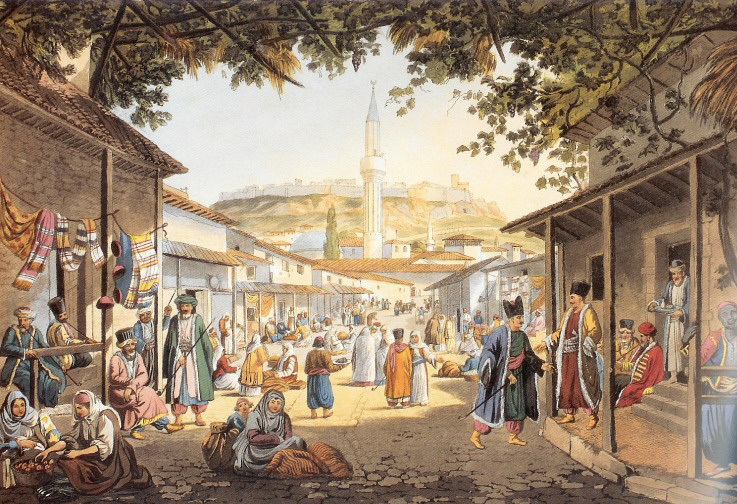 Upper Bazaar of Athens by Edward Dodwell. How have the Ottoman Muslims, Jews and Christians imagined the Greek and Byzantine pasts? Two presentations dispel the notion of an Ottoman population indifferent to antiquities and unearth a fascination with the classical and Byzantine eras that has largely been forgotten by modern scholarship. In the 18th and 19th centuries, the Ottoman Empire laid claims to the ancient and Byzantine heritage as its own cultural patrimony in an attempt to position itself as a modernizing state and the rightful heir to the region’s historical past. At the same time, different political actors, (from the Muslim Ali Pasha of Yannina to the Christian and Jewish residents of Thessaloniki), engaged with the Byzantine past to counter authority and strengthen their own position in an ever-changing political landscape. Light refreshments will be offered. The event is free and open to the public.